The East Bank Clinic’s Alex AIDS Orphans Project was initiated in 2001 when the staff members at the children’s clinic became aware of an increase of young patients missing appointments and dropping out of treatment. Large numbers of children were losing their parents due to AIDS related illnesses and were under the care of elderly grandparents. Since then, Alex AIDS Orphans Project has provided support for these children and their caregivers. The East Bank Clinic is essentially a mental health unit addressing the needs of children identified by their teachers as having problems. Over 150 children attend the East Bank Clinic for counseling at any given time. The behaviour problems of most of these children stem from the compounding influence of poverty, a violent environment and the loss of their parents, sisters, brothers, cousins, aunts and uncles from HIV/AIDS. It was as a nurse at the clinic that Rose Letwaba noticed that more and more often the caregiver bringing the child for counseling was a Gogo. “We’d heard about the tree from Stephen Lewis. It is a magnificent tree — its arms reaching out perhaps four or five meters in all directions offering to all a shaded respite from the heat of the day. This tree - silhouetted against a clear blue sky. It is the first thing you see as you climb the rise to the East Bank Clinic. And it is an image that stays with you long after you leave. 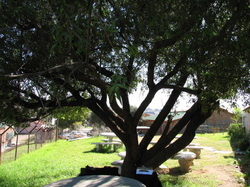 The Gogos would wait for their grandchildren under this tree. They had lost their own children and were now bringing their grandchildren to the clinic for counseling.